Dr. Erin Gustafson was born and raised in northeast Texas, relocating to Lubbock to complete her undergraduate degree in Zoology at Texas Tech University. Gustafson Dental offers a full array of dental services to help you maintain healthy teeth. You can read more on this page about specific services. In addition to being interested in the beauty of your smile, we are concerned with the health of your mouth. To help you achieve and maintain your optimal oral health, we focus on preventive care and regular dental checkups. This not only keeps your teeth and gums looking good, feeling great, and functioning well, but keeping up with your oral health can also significantly reduce the amount of money you’ll have to spend on dental treatment later in life. Using this camera, we can give you a “tour” of your mouth on a TV screen. We also use the intraoral camera to guide you through your diagnosis and treatment options, keeping you at the center of your treatment plans. We want you to feel informed at every step of the way, so you can make smart choices for your oral health and smile. Digital x-rays are a fast and comfortable way for us to accurately diagnose your oral health needs. They emit up to 90% less radiation than conventional x-rays and require no chemical processing, so they’re easy on you and on the environment. Digital imaging allows us to give you a preview of your new smile before treatment even begins. Come in and we’ll show you! Because composite fillings can be bonded to teeth, they allow for more conservative preparations. When less tooth structure is removed, Dr. Gustafson can create smaller, more natural looking fillings than amalgam (silver) fillings. The tooth-colored material is cured with an intense light and the surface is shaped and polished to match the rest of your tooth, rendering the final restoration smooth and virtually undetectable to the eye. If chipped, discolored, or misshapen teeth make you self-conscious about your smile, veneers are small inventions that make a BIG difference. Porcelain veneers are sculpted by hand and adhesively held, or bonded, to the front side of your teeth to revive your smile. Veneers look and feel like natural, beautiful teeth, and are an excellent cosmetic solution for teeth that are too discolored for traditional teeth whitening methods. In addition to giving you the benefit of a cleaner looking and more attractive smile, whiter teeth can also enhance your confidence and self-esteem. A brighter smile can even lead to healthier teeth because when your teeth look better, you tend to take better care of them to keep them looking great. With custom take home kits and Zoom!™ one-visit bleaching, we’re sure to have a professional whitening method that’s right for you. Ask us about your options at your next visit! Many of the millions of people who are missing teeth struggle with ill-fitting, uncomfortable dentures or retainers with false teeth. If you know what this feels like and are ready for a solution, Dr. Gustafson has one for you! We can give your smile a second chance with dental implant restorations. Implants are effective in stabilizing dentures to fit better, feel better, look better, and chew better, which can resolve the practical and social problems often associated with dentures. Implants preclude cavities in restored teeth, reduce your risk of needing a root canal, and healthy implants can even prevent bone loss. Dental implants can also be used in some crown and bridge applications, as well as single-tooth replacements. Call us to find out more about how this superb option in restorative dentistry could change your life. Dental anxiety is not unusual, and people of any age can experience such feelings. We will adjust our care to meet your needs, so you can receive the dental treatment you desire at a pace that feels comfortable to you. We also offer nitrous oxide (laughing gas) and oral conscious sedation to help you relax. Please share your feelings and concerns with us, so we can accommodate you and make your dental visits as anxiety- and pain-free as we can. We know how stressful life can be, and we believe that going to the dentist should—and can!—be a relaxing, worry-free experience. We offer complimentary beverages, WiFi internet access, and a children’s play area with video games, as well as TVs, headphones, and blankets in all of our treatment rooms, to keep you comfortable and entertained throughout your visit. You might even forget you’re at the dentist! 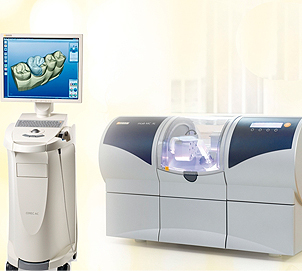 Sirona Dental Systems changed the face of dentistry by creating CEREC dental restorations. To date, CEREC is the only method that offers single-visit chair side restoration. All-ceramic crowns are fabricated and placed in one easy dental appointment! CEREC is fast, safe, and provides a natural-looking restoration that will stand the test of time.